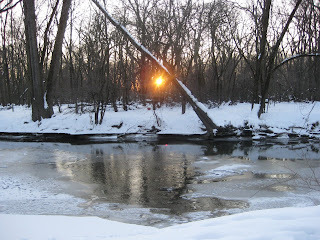 During my run late this afternoon, I was fortunate enough to enjoy this scene of the sun setting over the North Branch of the Chicago River in Morton Grove's Linne Woods. Today the was the warmest day in quite a while--37 degrees. I-80, America's second-longest interstate highway, is the closest thing to being the nation's main street. Not only does it approximate the old Lincoln Highway, but west of Omaha, the road's path closely matches our first transcontinental railroad. I've driven on I-80 dozens of times, and noted to myself, when I've seen a sign promoting an historic site, "One day, I'll pull off and go there." "One day" was a Sunday earlier this month, when Little Marathon Pundit and I visited the Herbert Hoover Birthplace and Museum in West Branch, Iowa. It's about a one-quarter of a mile north of I-80. Hoover was born in 1874, and amazingly enough, he was the first president born west of the Mississippi River. Louisiana was admitted into the union in 1812, part of that state is west of the great river. 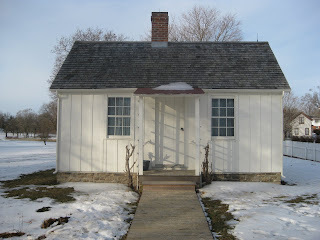 The two room cottage where Hoover was born was built in 1871 by the future president's father, Jesse, and his grandfather. The Hoovers, Herbert had an older brother and a younger sister, lived in the two room house until 1879, when they moved to a larger home in West Branch. They were devout Quakers, on the birthplace site, pictured on the right, is the Friends Meeting House, where the Hoovers and other Quakers--who are formally known as the Society of Friends--worshipped. 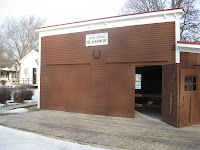 The 31st president's father was a prosperous blacksmith, and a reconstructed blacksmith shop, pictured on the left, is on the grounds, as is his first school--the original structure survives. Circumstances for the Hoover family took a tragic turn in 1880 when Jesse died. Four years later, Hulda, Hoover's mother, passed away. The three children were sent to live with different relatives, although they were reunited under one roof in 1888. A few years later, Hoover enrolled at Stanford University, and began his career that brought him to the White House in that fateful year of 1929. My recollection of my father is of necessity dim indeed, but I retain one vivid memento from this time. Playing barefoot around the blacksmith shop, I stepped on a chip of hot iron and carry the brand of Iowa on my foot to this day. "Hold On," Tom Waits, 1999. It's not easy to run when it's cold, but somehow I manage. 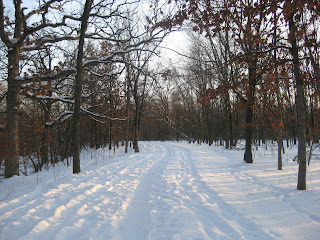 Although I'm usually the only one on the North Branch of the Chicago River trail when I'm out there. An answer, or one of the anwsers of what the Blagojevich family will do to earn money has been revealed. Illinois' former first couple plan to sell their Northwest Side Chicago bungalow. Supposedly Patti Blagojevich has been looking at condominiums on Chicago's Lake Shore Drive. That house, however, may figure into the Blago scandals. Did Rezko switch on Gov. Blago's home improvement? Sitting on my desk is the 2009 Illinois Travel Guide. On the cover is Abraham Lincoln. The anniversary of the birth of the greatest Illinoisan is next month, and the state bureau of tourism made the right decision by focusing on Honest Abe for this year's guide. A project like this takes months to produce. Most of the work on this year's guide was probably completed when then-Governor Rod Blagojevich sneaked back to Illinois on the day Barack Obama gave his acceptance speech at the Democratic National Convention in Denver so he can begin the process of drastically to close nearly two dozen state parks and historical sites. Hours were cut and many others. In November, that list was cut slightly to just 19 locations. Lincoln was hit hard by Blago's pen. Remember, this is Lincoln's bicentennial year, interest in the 16th president is at a peak, Illinois should be primed for the onslaught of tourists coming here to learn more about Lincoln. I'm looking at page 11 of the travel guide, there is a picture and description of the Lincoln Log Cabin site near Charleston, where his father and beloved stepmother lived, Abe owned the home and the surrounding land. Blago closed in on December 1. Innocent motorists picking up a travel guide at a state welcome center might decide, "Hey, let's go there." On the next page, the Vandalia Statehouse, Illinois' second state capitol, is touted. Hours were drastically cut at a slew of other Lincoln sites, and some seven-day-a-week sites turned into five-day-a-week locations, or in the case of the Lincoln-Herndon Law Offices, just one day a week. The offices are promoted on page 8, as is Springfield's Old State Capitol, where Barack Obama began his successful presidential campaign. Blago cut that historical site, where Lincoln gave his "House Divided" speech to five days a week. 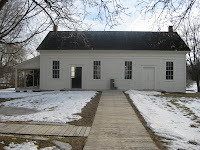 What about New Salem, where Lincoln first lived on his own? Five days a week. Thanks to funding from the Illinois Abraham Lincoln Bicentennial Commission, the Lincoln-related sites, but not the closed ones, will go back to a seven-day schedule this spring. However, that funding will not last forever. Back to the travel guide: If you go to page 163, you'll see the Carl Sandburg birthplace in Galesburg. It's closed now. As are nine other state historical sites, and seven state parks. Even when he was still lieutenant governor, Patrick Quinn said he was opposed to the closings. In a press conference yesterday, his first as governor, Quinn said he wants to reopen the parks and historical sites Blago closed. Which prompted one reporter to shout out, "Where will you get the money?" 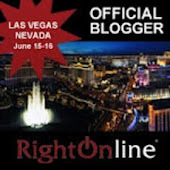 In an e-mail message sent last night, possible gubernatorial candidate Bill Brady (R-Bloomington) said, "We have had a governor who has balanced the State of Illinois budget with a credit card." We also just threw out a governor who ran the state on "pay-to-pay" principles. And you can't shakedown an historical reenactor working at the Lincoln Log Cabin site. How do I know? Well, if there was a way, Blago would have done it. I have faith that there is a way to reopen these places without breaking the state's bank. Meanwhile, there are thousands of obsolete Illinois Travel Guides out there, warts and all, that will allow tourists to mistakenly plan their visits to the Land of Lincoln. Oh, I almost forgot. Illinois' Historic Preservation Agency web site is out-of-date too. It gives internet surfers no notice that some of the locations listed are closed. Although the site does say, "Pat Quinn, Governor." And when you click on the site-hours button, it leads to a dead link, at least it is that way this evening. Micheal Steele, the former lieutenant governor of Maryland, is the new chairman of the Republican National Committee. It's a good choice, and he wants the party everywhere, declaring, "We will grow this party in a way not seen before." Steele is the first African-American to lead the party of Lincoln. Congratulations. And don't forget us, chairman, here in Illinois. In fact, winning Illinois for the GOP should be at the top of your list of priorities. The Palmetto Scoop is live blogging the choosing of the next Republican National Chairman. 1:37 (EST) - Third ballot results: Steele 51, Duncan 44, Dawson 34, Anuzis 24, Blackwell 15. Mike Duncan the incumbent, just withdrew his name from consideration. Michael Steele, Maryland's former lieutenant governor, seems (to me) to be the choice of the blogosphere. The other candidates are Katon Dawson, the chairman of the South Carolina Republican Party, Saul Anuzis, his Michigan counterpart, and former Ohio Secretary of State Ken Blackwell. The fourth round ballots are being handed out as of this writing. UPDATE 3:00pm CST: The fifth round has ended, and their are only two candidates left: Steele and Dawson. Blackwell has endorsed Steele. I'm watching Vice President Joe Biden giving a speech on Fox News. He just announced a new web site, A Strong Middle Class. Biden is the chair of a new task force dedicated to strengthening the middle class. I don't expect Biden, or Barack Obama, or any politician to be against the middle class, but this sloganeering and overuse of campaign rhetoric reminds me of the "perpetual campaign" style of government practiced by Bill Clinton. Does anyone seriously expect Biden's task force to achieve anything meaningful?